Visit playgrounds often. 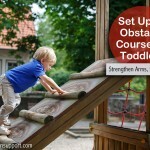 When children see the slides and climbing structures, they naturally want to run, swing, and climb everything in sight. 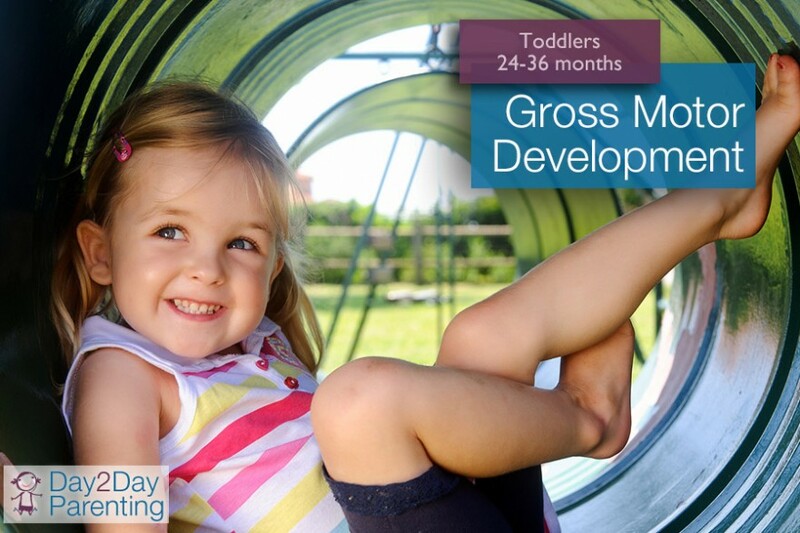 If you can’t make it to the playground, chasing each other in the backyard or taking a walk can help your child’s little muscles grow strong. Imitate each other. Stick your arms out wide and pretend to fly around the room. Tell your child it’s his/her turn to be the bird. Then, let your child be the leader and you copy whatever he/she does. Become a horse. If you cross your legs and place your child on your knee, it’s easy to take it for a horse ride. A variation would be to hold your child’s hands while it straddles your foot. Then bounce, bounce, and bounce some more. Play catch. Show your child how to hold out its hands and throw a ball directly, and gently, into them. Start out standing close together. As your child gets better, move farther away. It’s soccer time! Turn a large box on it’s side to become your goal. Then take turns trying to kick the ball into the goal, cheering when your little athlete makes a goal. Let’s be kangaroos. Make a chalk line on the sidewalk or place a washcloth on the floor. Show your child how to jump with both feet together and see how far each kangaroo can jump. Have fun with balloons. Here’s a fun game for a rainy day. Kick a balloon from one side of the room to another. Put a laundry basket on its side and your child can kick it into the basket. Act like animals. Can your child stand like a flamingo, squat like a duck, run on all fours like a lion? It’s fun to try. Don’t forget to make the appropriate animal sounds! Make a river. Put a folded towel on the grass. Tell your child the towel is really a river and ask if he/she can jump over the river without getting his/her feet wet. As your child gets better, unfold the towel for more of a challenge. Go nuts with bubbles. Blow bubbles up high and watch your child jump and try to pop the bubbles by clapping its hands. Switch and blow the bubbles towards the ground so it can stomp on them.